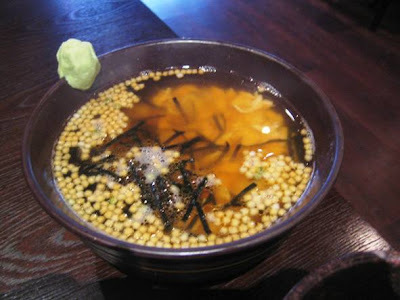 Long Beach is suddenly rollin' in Ramen! Hello Ramenistas, after a long hiatus, the Rawfishy is back on her blog! And I've got real news to share for all you Southern California Ramenistas: Authentic Ramen in Bixby Knolls! Buttery bluefin - no more? NPR and the Associated Press have been reporting on the Convention on International Trade in Endangered Species, or CITES, in Qatar quite well, including this balanced story about the controversial proposed ban on the export of Atlantic bluefin tuna. 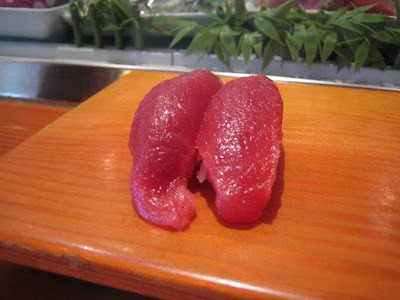 Naturally, I'm somewhat conflicted: I unabashedly love bluefin and understand my peeps' almost fanatical devotion to it. But if the Atlantic population is dwindling and endangered, I'm all for a ban to help the species recover. It's not that painful of a sacrifice when you consider: A. 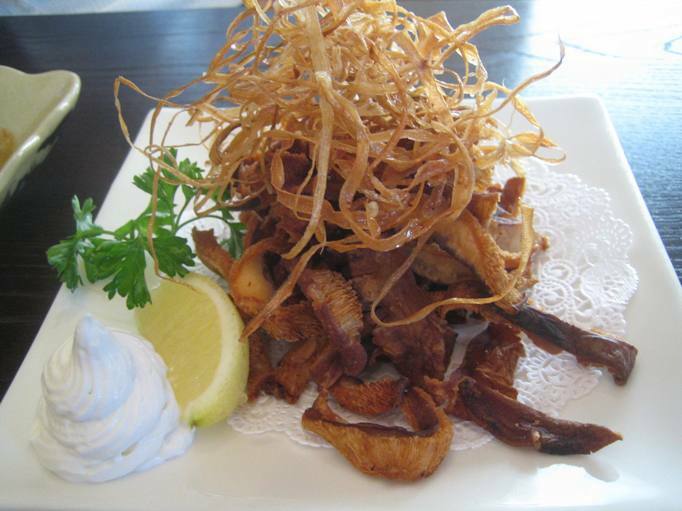 There are plenty of other delicious sustainable seafood offerings, and B. Limiting bluefin consumption might help your wallet recover, too. I guess if you're a sushi-ya owner in Japan, you'd panic about the potential loss of $$$ without the prized bluefin in your stock. But come on ... Japan's overconsumptive ways are almost a global embarrassment, and current headlines about Toyota's crazy killer cars and the documentary "The Cove" aren't helping matters. So it might help Japan's image - as well as the poor bluefin's survival - if the Japanese would just agree to this ban, rather than fighting it like a petulant kid. Going to Izakaya Wasa made me realize how long it had been since I'd been to Kappo Honda in Fountain Valley - the real deal when it comes to izakaya. 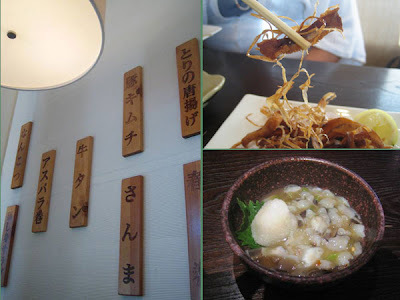 While Wasa provided a lovely experience, I suddenly craved the more down-to-earth offerings - and the huge menu - of an authentic, warm and casual izakaya. So my friend Amy (who is also Japanese) and I met up in Fountain Valley, which is another popular Orange County city for Japanese eateries - in fact, I like to call the intersection of Brookhurst Street and Ellis Avenue "O.C. 's Yakitori Central," with Kappo Honda on one side of Brookhurst and Shin Sen Gumi on the other. Anyway, Amy and I were both craving J comfort foods that we hadn't enjoyed in a while, and Kappo Honda did not disappoint. Kappo Honda is located in a classic mini-mall, but once you step inside, you're transported to a rustic Japanese izakaya. You'll find plenty of wood decor and Japanese diners - including lots of families. We tried to choose from every category: starters, stewed dishes, yakitori (grill), rice dishes ... but we still ended up not ordering anything from the grilled or raw fish categories (well, my Ikura Oroshi could fit the raw category). The grilled offerings here were much better than at Izakaya Wasa: more complex and interesting in their flavor combinations, with meat that is tender and almost juicy, not grilled to dryness. At left is gobo and pork (burdock root wrapped in a bacon-like strip of pork and grilled). I decided to pass up my usual favorite of pork-wrapped asparagus and I think I found a new favorite. Gobo is usually very crunchy, similar in consistency to carrots, but in this case, it was clearly cooked in a sweet soy bath before being wrapped in the bacon-thin strips of pork and grilled. That resulted in a soft consistency and a nice, sweet, stewed flavor that paired remarkably well with the contrasting salty, slightly charred pork. 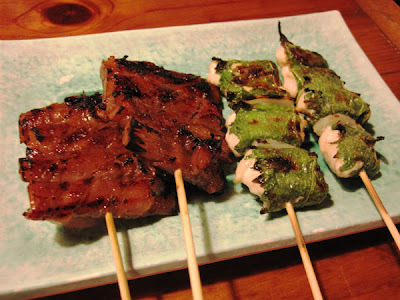 The chicken breast wrapped in shiso leaf (at right in photo) was paired with white onion slices on the skewer for a refreshing, lighter-flavored skewer. I also ordered the spicy chili chicken wing, curious how this would be prepared. It was DELICIOUS - just the perfect amount of red chili salt, and the wings were surprisingly juicy and tender, again not grilled to dryness. Amy ordered her favorite grilled ginko nuts (at left in photo) - strong, distinctive nutty flavor that's similar to chestnut but much stronger in flavor. Next, the Ikura Oroshi: salmon roe served with grated daikon radish. 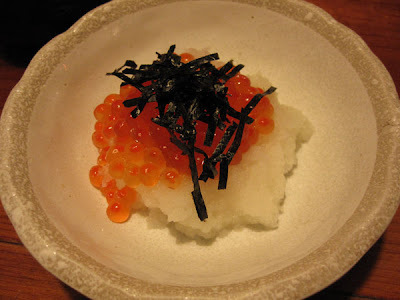 As you can tell from my prior blog posts, I love ikura - salty, flavorful morsels. 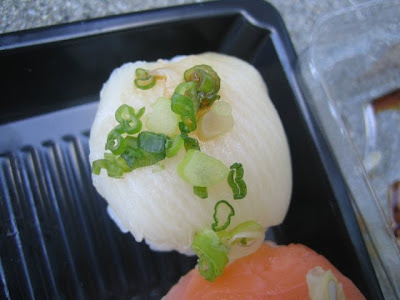 And paired with tangy daikon, it was heavenly - strangely, the two strong tastes balanced each other perfectly in this combination: the salmon taste cut the bite of the daikon but didn't overpower the radish flavor either. I was going to order a side of rice to eat this with, but I found myself slurping down the entire serving (about the size of a scoop of ice cream) with great satisfaction before I could even think about flagging the waitress. I initially thought the sweet potato croquettes might taste bland, but I was pleasantly surprised by the smooth, oh-so-slightly sweet potato flavor - actually not as bland as regular potato korokke. The black sesame sprinkled in the panko batter was also a nice touch and may have influenced that smooth, overall mellow, but distinct flavor. I may have a hard time having regular korokke again. 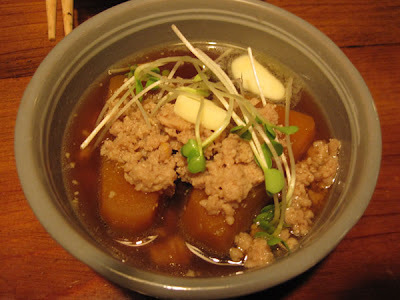 The stewed kabocha and ground chicken was pure comfort food - sweet, meaty kabocha pumpkin and ground chicken stewed in a fish broth flavored with soy and brown sugar. I practically slurped the whole bowl down - luckily, I was cognizant of the fact that I was sharing the dish with Amy, so I refrained. Finally, we had to order grilled onigiri and ochazuke - OF COURSE! We ordered one small bowl of salmon ochazuke to share, figuring we could always order another if it wasn't enough. The bowl looked small but it ended up providing two perfect portions considering all the other food we had. As expected, this ochazuke was satisfying, though it tasted more salty than others I've enjoyed recently. 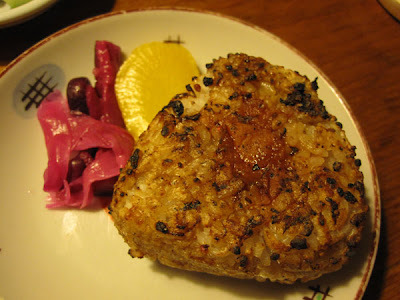 And the grilled onigiri was perfect - grilled perfectly to be crunchy but also fluffy enough on the inside, with some of the teriyaki marinade seeping into the rice - much better than the grilled onigiri at Izakaya Wasa that tasted too charred and dry. Total bill for two: $41. We didn't order any alcoholic beverages because the hojicha (a roasted green tea that has a toasty, nutty flavor) tasted so good, went so well with the hearty food and was endlessly refilled by the diligent servers. We two petite Japanese women were full. It may take a little more to satisfy a man-sized hunger. But even if we had ordered a few more dishes, we still would have gotten out of there for less than $40 each, including tip. Kappo Honda set a new standard in my current izakaya craving period. Would Shin Sen Gumi across the street stand up to this level? With the weather getting a bit cooler and the sun going down earlier these days, it's prime izakaya season. Izakayas - or Japanese pubs - are good any time of year and ubiquitous in Japan, popular with office workers, college students, even casual dates. But with long menus of small bites, ranging from fresh vegetables and fish to fried and home-style comfort foods, izakayas are especially appealing when you crave warmth and solace. But these Japanese pubs don't seem to have really caught fire among mainstream diners here in Southern California, who still seem to be caught up in sushi as the icon of Japanese cuisine. 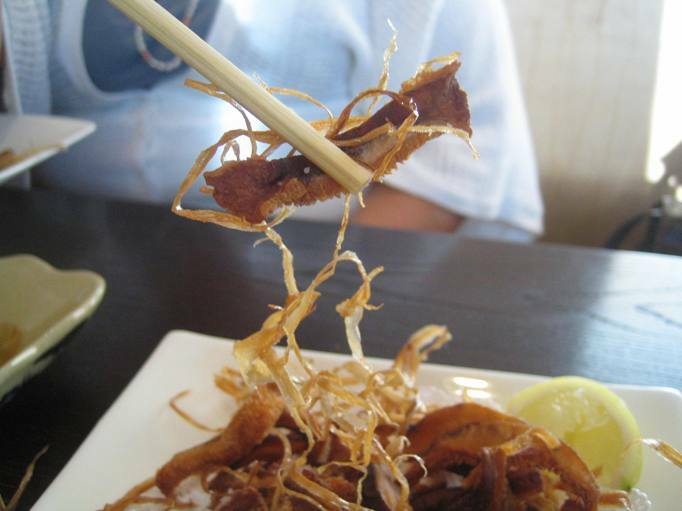 There are plenty of izakayas in Japanese-rich areas of Los Angeles, like central L.A., the Sawtelle-Olympic area and the South Bay (Torrance and Gardena, especially), but mostly Asian and foodie diners frequent them. A couple of years ago, Takashi Abe of Bluefin fame opened Izakaya Zero in Huntington Beach, and as expected, the talented Abe took the tavern fare up quite a few notches in quality and added modern fusion touches. But just a few months ago came word that Izakaya Zero had closed. So I hope Izakaya Wasa, the creation of another Orange County gourmet-Japanese pioneer, James Hamamori, can carry on the izakaya education. I finally made it to Izakaya Wasa, which opened in Irvine Spectrum Center about a year ago. 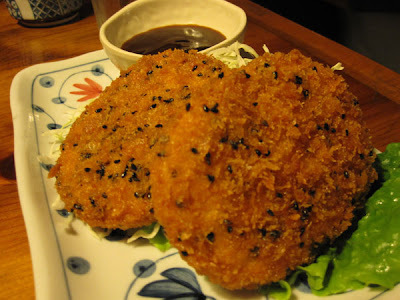 It's a nice place for mainstream diners to discover the joys of izakaya. The key ingredients for success are here: good food; lovely, modern atmosphere; hip, well-trafficked location. 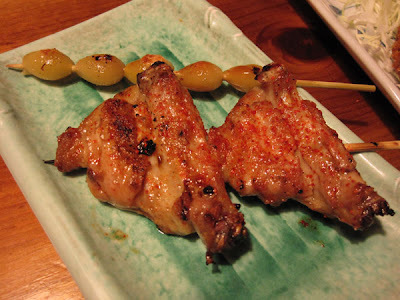 Izakaya Wasa is definitely a place balancing the old and new. 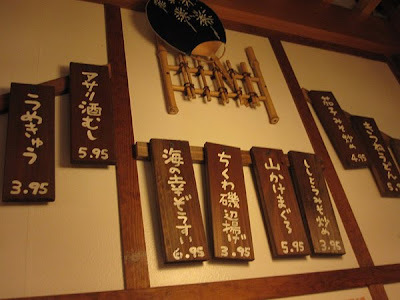 One wall is decorated in old-school style, with wooden panels serving as a wall menu listing various dishes. And consider the cocktail one friend enjoyed on my first visit: a lychee shochu martini. 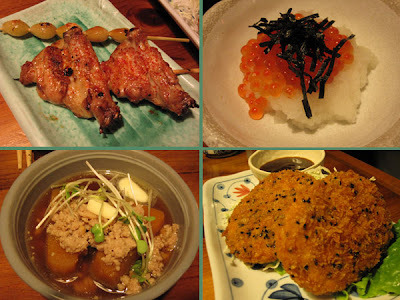 The menu is wide-ranging, as expected at an izakaya, and tries to balance the modern tastes with the traditional. You can get raw or broiled fish, grilled or stewed meats, vegetables cooked in the Japanese way to stay firm and flavorful, and there's even a couple of udon or soba offerings and a ramen bowl. 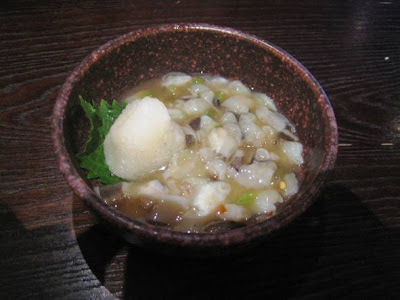 There also are some salads that sound rather ubiquitous (salmon skin salad, beef salad ...) and some Japanese-style desserts, including one of my favorites: Zanzai, a traditional sweet red bean soup. Our party of three ravenous women tried different dishes from different parts of the menu. In this photo, that's the Crispy Calamari at top with yuzu-miso sauce for dipping, and Beef Tataki with Apple Sesame in the foreground: Seared New York steak, raw on inside, apple sesame sauce, daikon & green onion garnish. Yummy, tender beef with a refreshing, slightly sweet-tangy sauce. All very nicely prepared, with fresh, high-grade ingredients and lovely tastes. But a bit predictable. I wanted to try more of the classic izakaya grilled fare, so we enjoyed skewers of roasted shishito peppers, meatballs, and asparagus wrapped in bacon (an izakaya staple that everyone loves), and my personal favorite: grilled onigiri - rice balls brushed with teriyaki sauce and grilled to crispy-outside, steamy-inside perfection, with bits of salmon, salty seaweed or sour plum tucked in the middle of the mass of rice. I've never tasted anything like this: sliced shiitake mushrooms fried and sprinkled with sea salt, served with a whipped sour cream infused with truffle oil for dipping. Shiitake is so strong in flavor that it's typically used to add taste to dishes. But when it's fried like this, it becomes very mellow in flavor - almost creamy smooth. Going by that description alone, you'd think I would find this dish bland. But no - there's something very addictive and deliciously rich about these fried morsels. I gobbled them up, eating them mostly unadorned but occasionally dabbing some of the cream on the fries. After this first experience, I found myself still wanting - I hadn't really tasted enough rustic, traditional fare. So I returned another night with another friend and a mission of ordering a few more traditional stewed dishes. 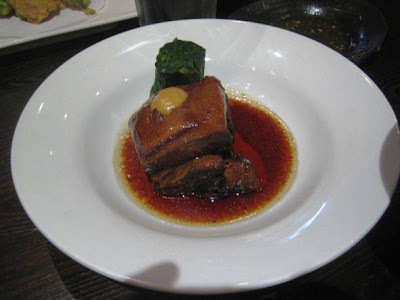 The Kakuni - slow-cooked pork belly in sweet soy sauce, served with steamed spinach & Japanese mustard garnish - epitomized comfort food: fatty, moist, flavorful. But I was disappointed in the Agedashi Tofu, another izakaya staple, featuring fried tofu that's usually served in a shallow pool of broth that's been poured over it. At Wasa, the fried tofu came out dry and tasted bland (see left photo below). I guess I should have heeded the description: "Starched then fried bite size tofu, bonito flake garnish, green onion & ginger tempura sauce for dipping." A dipping sauce just doesn't cut it. The tofu needs to bathe in the broth and soak up some of that subtle fish-stock flavor! The tuna poke pictured at right was also rather "meh" in flavor, though made with high-grade, crimson-colored chunks of fish. 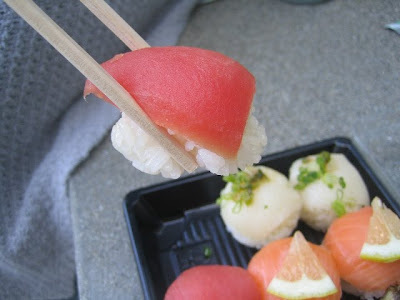 Perhaps my taste buds have gotten bored by all the tuna/ahi pokes out there. On the far other side of the taste spectrum was the refreshingly delicious Takowasa ("Octopus Wasa") - raw chopped octopus marinated in wasabi sauce. Not as spicy-hot as you'd expect - just a very pleasant horseradish-y tang giving the mild octopus a flavor punch, while pieces of wasabi stalk provided a subtle crunch (almost like celery with mild heat). 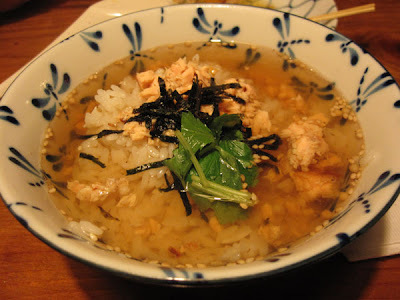 And, of course I ordered ochazuke (rice soup) with salmon (another favorite you'll see mentioned throughout my blog), and Wasa didn't disappoint. Overall, Izakaya Wasa is quite satisfying on all levels. But some of the menu is quite predictable. It's best to try the less familiar, traditional dishes that epitomize the nuanced flavors of Japan - and, of course, those addictive shiitake fries! Don't let the "small plates" concept lull you into thinking this is inexpensive fare. Most of the dishes run around $4-$8 each, which can add up as your party orders various plates to taste and share. And of course, the sushi is in a separate price range of its own! Still, it's worth the time and money, especially during these fall-winter months. Thanksgiving feast, Japanese vegan style! How's this for a yummy, healthy alternative to the same ol' turkey dinner? And all for just $34.95 per person! More details (including a reservation requirement, and restaurant hours) are on the Shojin blog as well as on the main Shojin web site. As I noted in my earlier post, Shojin's food is super tasty and made with fresh organic ingredients. And the vegan "turkey" (billed as "sooooo soft and moist :) Yum yum!!!") is made with seitan (wheat gluten), which is high in protein but doesn't have the sleep-inducing tryptophan that turkey does. So perhaps even non-vegans will feel energized - and their stomachs very thankful! - after this meal. In fact, the menu and photo are tempting me to treat myself to a second Thanksgiving Day meal at Shojin ... Anyone wanna join me? A few months ago, I pondered the idea of raw fish becoming "extinct" in sushi bars. It's a dilemma for me: I do love fish, but I also worry about sustainability, and the impacts to the eco-system of my eating habits and pleasures. 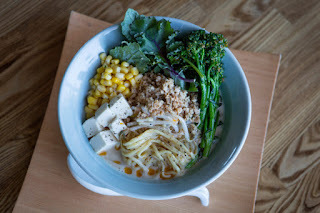 So I was pleased to hear about Shojin, a Little Tokyo eatery that focuses on organic, natural, vegan Japanese cuisine. The phrase "Contemporary Organic Fusion Cuisine" on the web site's Menu page made me cringe a bit, but when I clicked on the "Why Shojin" tab, I was reminded that this type of food is actually more ancient Japanese than trendy. The photos at top, of little dishes of cooked vegetables, actually depict some of my favorite Japanese foods (stewed pumpkin, tofu, shiitake mushroom), and the "What's Shojin cuisine?" section explains that this is "very traditional Japanese cuisine and originally Buddhist vegetarian cooking." 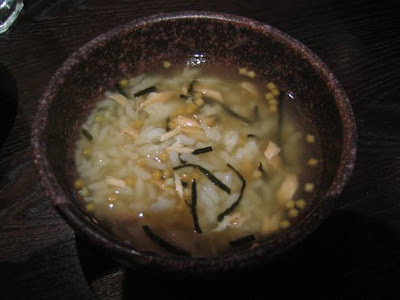 The web site explains that Japanese-style Shojin cooking is believed to have originated during the 13th century. A Buddhist Zen sect leader who had trained in China brought back Chinese cooking techniques and practices, thus creating a new Japanese cooking style with innovations like frying and deep frying and using miso, soy sauce and vinegar seasonings. 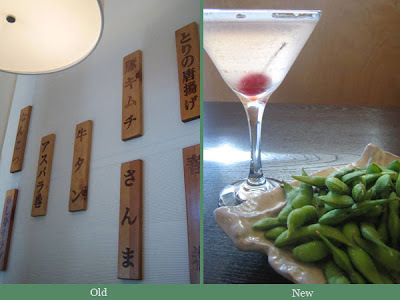 So, like the Fishlips sushi truck, Shojin's vegan organic cuisine is actually an old concept that is new again, revised with contemporary touches. I got a chance to visit Shojin recently, and while this isn't a sushi place (and in fact has very limited sushi offerings), the overall menu is well prepared, very reasonably priced and definitely more tasty than what you sometimes get at mainstream vegan eateries. Shojin is a fairly small, cozy place located on the top floor of a three-story shopping center. But the restaurant's interior is nothing like a typical mall shop; it's decorated in an eclectic, warm and artsy style that makes you feel like you're in an European bistro. The young, attractive waiters were soft spoken and very accommodating. The menu is plentiful - numerous pages with photos of the dishes, presented in a slim notebook binder. 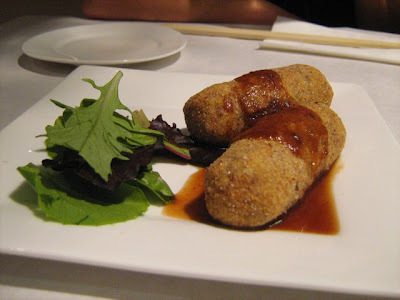 We started with the pumpkin croquette appetizer (about $6), served with a light tomato sauce. The flavors were mild and comforting, the texture a nice mix of crunchy and smooth. We also had a small dish of miso eggplant (which we failed to photograph because I tore into it so quickly! ), for about $5. I love traditional miso eggplant with its great mix of salty and sweet flavors, bound together by meaty eggplant. The Shojin version was good, but not noteworthy. The dish tasted very fresh, with the roasted veggies (not solely eggplant - I think there was some squash in there, too) very flavorful but almost not cooked enough - too crunchy in texture. Traditional miso eggplant is stewed, allowing the flavors and textures to mellow and meld. I specifically love the comfort-food texture of it. For our "entrees," my friend Samantha and I wanted soba (buckwheat noodles), but we also decided to split a Shiitake and Avocado Roll ($5.25) as a "side" (pictured at top of post). 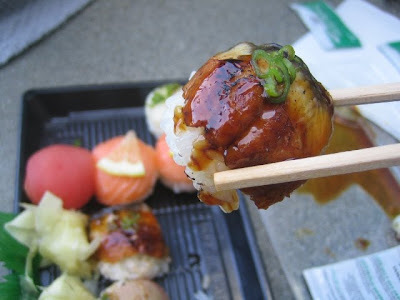 This is one of a handful of sushi rolls offered; there's also a "Caterpillar Roll" with avocado and barbecue seitan (wheat gluten meat substitute), covered in sauce. 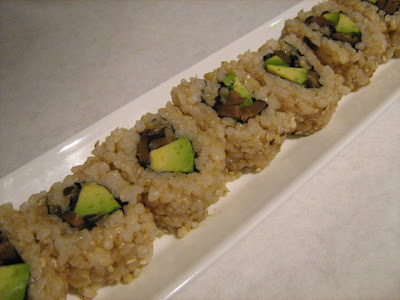 I prefer non-sauced rolls, and the traditional salty flavors of Shiitake mushroom and konbu (seaweed) cooked in a sweet soy sauce, rolled with avocado in a brown-rice roll flecked with sesame seeds, hit the spot. Finally, our soba dishes came out. I had the Yamaimo Ume Soba ($10.45), a traditional favorite of mine: Buckwheat noodles in a cold soup topped with gooey-starchy mountain potato, ume (sour plum) paste, radish sprouts and seaweed slivers. 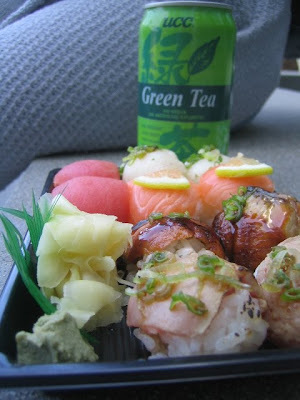 Very refreshing, with the tangy-salty Japanese flavors that I love. 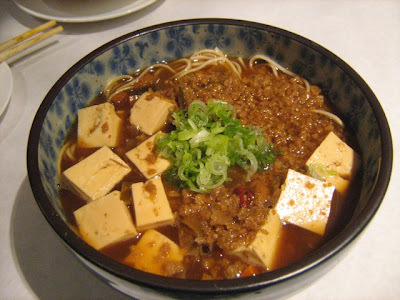 Sam had the Spicy Tofu Soba ($9.95) with buckwheat noodles in a spicy miso soup with tofu and ground veggie "meat." This was clearly a version of the Chinese-style mabo dofu, in which tofu cubes are covered in a sauce of spicy ground pork - sorta like the Asian version of Bolognese sauce. 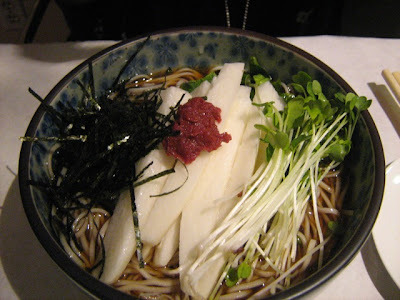 I'd like to come back for this comfort-food soba now that the weather is getting colder. The lengthy menu also had some curry dishes that looked good (Japanese curry is milder in spice and sometimes almost sweet; I'm curious what the flavors are at Shojin), and also some lovely bento box combinations I'd like to try sometime. As you can tell from the prices I listed, this filling meal cost us about $25 each, including tip. 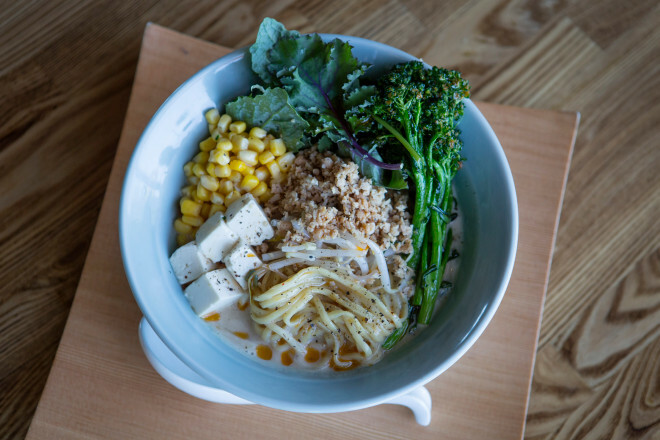 While this type of food will never be an adequate substitute for sushi, the flavors are nostalgic and comforting, and it's further comforting to know the chef is using organic, natural and fresh ingredients. This will definitely be a stop-in spot for me on my visits to Downtown L.A., and may become a good meeting spot for my vegetarian friends. YES! At long last, I was able to catch up with the gleaming raw-fish truck when it stopped in San Pedro today. 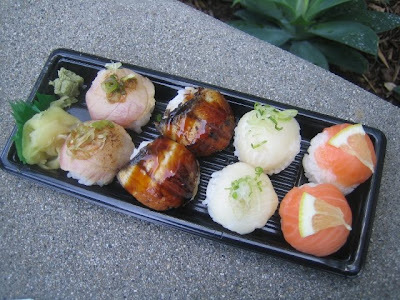 As you can see in the above photo of the temari (ball-shaped sushi), the quality is very good, especially when you consider it comes out of a truck. The salmon and hamachi (yellowtail) was the best catch of the day, both buttery smooth and so fresh and so clean-clean in flavor. And the pricing was just right. 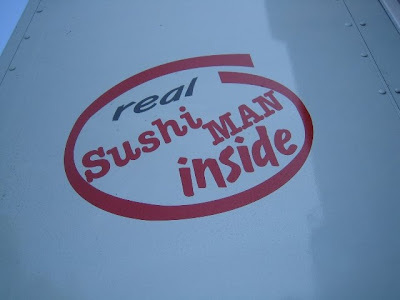 This is NOTHING like the packaged sushi at grocery stores - this is the real deal, freshly prepared for each order by an experienced sushi chef whose counter just happens to be in a well-equipped RV. Of course, it's also not the sublime, eyes-rolling-into-the-back-of-your-head amazing sushi that you do have to pay a bit more for. I've been dying to try Fishlips since July, when I first heard about it, checked out their web site and read several stories about the business. First clue that this would be authentic: The charming broken English on the web site. I also liked what I read in blog reviews about the clean, simple, high-quality but affordable sushi, and how they offered temari, a Kyoto-style sushi shaped in a ball rather than in the finger-shaped nigiri style. 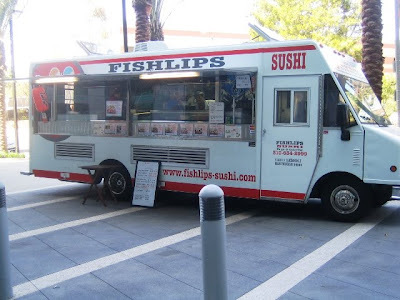 And finally, one really good story/review in Grub Street noted that Fishlips owner Takeshi Kimura (TK) wasn't simply following the mobile food trend when he started Fishlips earlier this summer. He actually was harking back to sushi's roots, back in Japan's Edo era, when sushi was sold and served from carts. Yes, sushi was originally fast food. 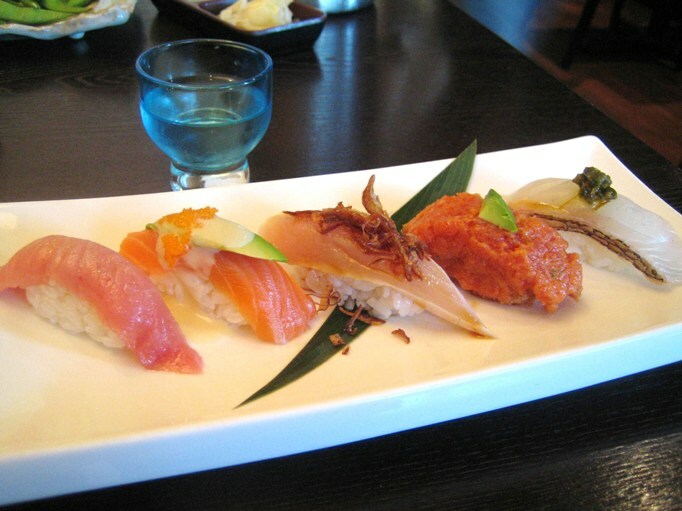 The modern-day sushi bar was actually established after World War II, TK told Grub Street. Anyway, I was intrigued. 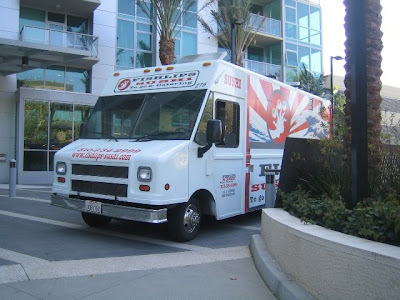 But because the truck locates mostly in Central and West L.A., I had a hard time making time to check it out. "We are in dire need of good sushi in Long Beach - all we have now in this big city is mediocre, mainstream, 'Banzai Crunchy Creamy Roll'-type places targeted at college-age sushi-novice diners. We Rawfishionados desperately need your fresh, simple, high-quality offerings!" "Yokoi-san, Thank you very much for inquiry. Yes, we are thinking to come over Long Beach. Only we have to research that we have to take extra health permission from city of Long Beach. (Only Long Beach, Pasadena, Vernon request it.) ... We are considering about Long Beach for any reasons. (Close to our office, good for lunch & night time.)" Luckily, I didn't have to wait until they got that extra health permit for my first taste of Fishlips. The truck was invited to the VUE condo tower in San Pedro, as part of a small health fair the tower organized, mainly for its residents, but open to the public. The truck was parked right outside the VUE lobby door when Brooke and I got there, excited and hungry, around 12:30 p.m.
NO CUSTOMERS WERE IN SIGHT. Brooke and I practically jumped up and down in glee. The truck is, indeed gleaming. 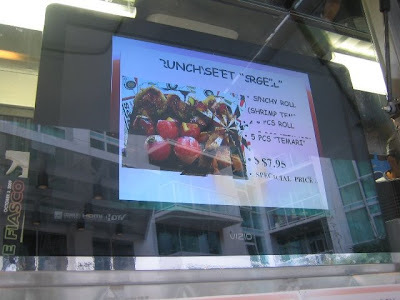 There are signs - both handmade and on a flat screen - hawking various "sets" that include rolls and temari. Temari is all Brooke and I were interested in. 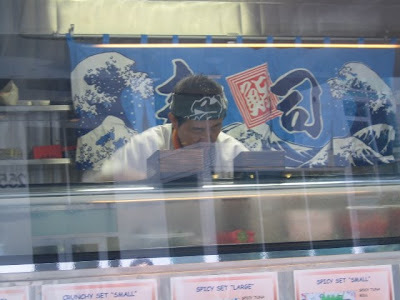 Mr. TK was taking orders at the window, and we asked him what he recommended as the best fish of the day. The salmon and the hamachi, he said, after consulting with the sushi chef. For our first round, we ordered one order (2 pieces) each of the salmon, hamachi, regular tuna, tuna tataki and unagi temari, which came to about $13.50. We also ordered two cans of hot green tea, which came out nicely warm - just like in vending machines in Japan, where you can choose hot or cold cans. Our order was ready in about 5 minutes. We sat down on a concrete ledge near the VUE entry and dug in. Fortunately, everything else was MUCH better, including the rice (the use of Koshihikari brand rice is proudly promoted on the Fishlips web site - "Japan's No. 1 Brand") and the wasabi, which had a good taste, not just heat, and made us almost think it was fresh ground stuff. For our second round, we ordered more hamachi, salmon, unagi and maguro tataki temari (the photo at top of post), and then Brooke noticed a "Long Beach Roll" on the menu, and asked why it was named after our city. Mr. TK called the jovial sushi chef over, and he explained that the chef who originally created it lived in Long Beach at the time. Tasty, but really "for Cooked-fishionados," noted Brooke. Yes. And the pieces were large and hard to eat. I deconstructed it and enjoyed the yummy fish off the top first, and then picked my way through the middle. Speaking of hard to eat, one note: The ping-pong-ball-sized temari is darn cute, but it can be a bit hard to pick up with chopsticks; the sushi sorta falls apart. So best to grab it and stuff it in your mouth quickly, or perhaps even use your fingers, as sushi originally was meant for. Overall, a pretty satisfying lunch for 2 for about $35 total (less than $20 each!). 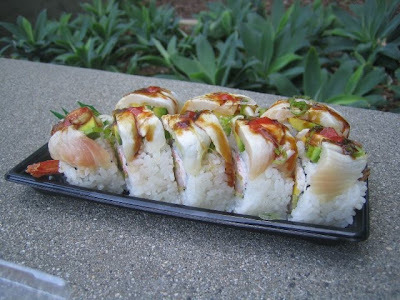 Fishlips is the perfect sushi fix when you're in a hurry and just want some fresh-tasting fare - sort of like getting a really good, freshly made sandwich with quality ingredients from a mom-and-pop cafe or deli. But with its limited menu, it won't fully satisfy like a full sit-down sushi bar will. I'd rate Fishlips 3.5 stars for the quality and its reasonable prices. 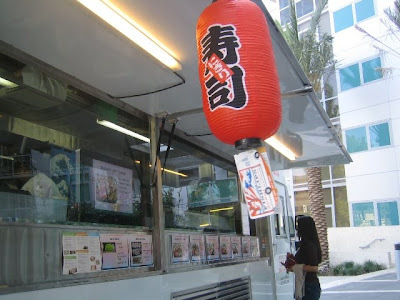 And I'll keep searching for Long Beach locations, and perhaps even research the city's health permit requirements for TK-san, in hopes of getting the truck in my neighborhood soon.